High test weight, early flowering with excellent spring emergence. Medium height hybrid for early grain. Plant for 26,500 P.P.A at harvest. GOOD SEED SUPPLY. Very good seedling vigor, plant health, dry down and yield potential. Excellent standability with strong stalks and roots. Medium tall hybrids with medium high ear placement and a semi flex ear. Plant for 27,000 P.P.A. at harvest. FAIR SEED SUPPLY. A very strong dual-purpose hybrid. Medium tall, strong, good looking plant with medium height and good ear. Excellent yield potential with fast dry down. Ear tips over with an open husk. Deep kernels on a red cob. Plant for 27,500 P.P.A. at harvest. VERY LIMITED SEED SUPPLY. Very good plant health, seedling vigor, stalk rating, fall dry down and yield potential. Plant health and stress tolerance are excellent. The plant is medium height with a medium height ear placement. A true dual purpose hybrid. BR09R19 canopies rapidly and shades weeds. Plant for 28,000 P.P.A. at harvest. GOOD SEED SUPPLY. A very attractive grain hybrid with excellent emergence and vigor. It grows rapidly to form a fast canopy. High test weight with grain that is rapid to display black layer with good dry down. Performs on variable soils and displays stress and drought tolerance. Plant for 26,500 P.P.A. at harvest. FAIR SEED SUPPLY. 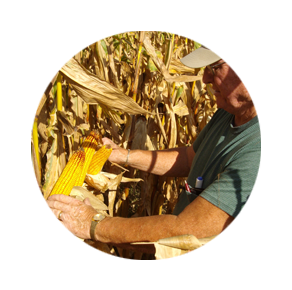 A tall dual-purpose corn that can tolerate stress with a good yield potential. Consistent cob size with an open husk to aid dry down. Plant for 29,000 P.P.A. at harvest. GOOD SEED SUPPLY. 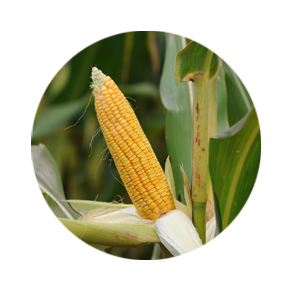 A dual-purpose hybrid with high yields in silage, high moisture, cob meal and combining. It shells extremely easy and is one of our best for hand shelling. Unrivaled standability, yield and fast dry down. Fairly tall hybrid with mid mount, semi flex ear. Husks tend to open near harvest. Plant for 28,500 P.P.A. at harvest. GOOD SEED SUPPLY. Fairly tall dual-purpose hybrid that is adapted to variable soil types. Very good yield potential, test weight, stress tolerance and plant health. Medium tall plant with a mid-mounted, fixed flex ear. Combines early but also yields well as high moisture and silage. Plant for 28,000 P.P.A. at harvest. GOOD SEED SUPPLY. Very good plant health, standability, dry down and yield potential. Good seedling vigor and stress tolerance. Short plant height with medium ear placement and flex ear. Plant for 27,000 P.P.A. at harvest. BR38G54 canopies quickly and has a medium stay green factor. GOOD SEED SUPPLY. Very good plant health, seedling vigor, stalk rating, fall dry down and yield potential. Plant health and stress tolerance are excellent. The plant is medium height with a medium height ear placement. A true dual-purpose hybrid. BR09R19 canopies rapidly and shades weeds. Plant for 28,000 P.P.A. at harvest. GOOD SEED SUPPLY.